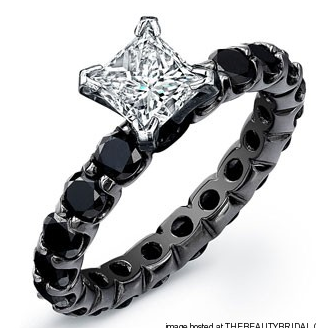 After i posted about personalized rings, i remembered i saw a black diamond at the chapel not long ago. usually i wouldn't like it, but it was a GORGEOUS ring that belonged to this beautiful woman with such poise, it made me think about it first. The groom chimed in and said at first, he really didn't want it for her, he thought people would think it was too different, but after he saw it on her, it was perfect. i really did agree. so what to do YOU think of other colored diamonds for a engagement ring? Here are a few i found that i kind of enjoyed! i see quite a few black rings for guys, and i really like them! If you have a ring that's different, i wanna see it! send it on over, and let me know what you think of these!